We don’t get to choose our parents. Even though we may love them and grow to understand them, we may never really know them. 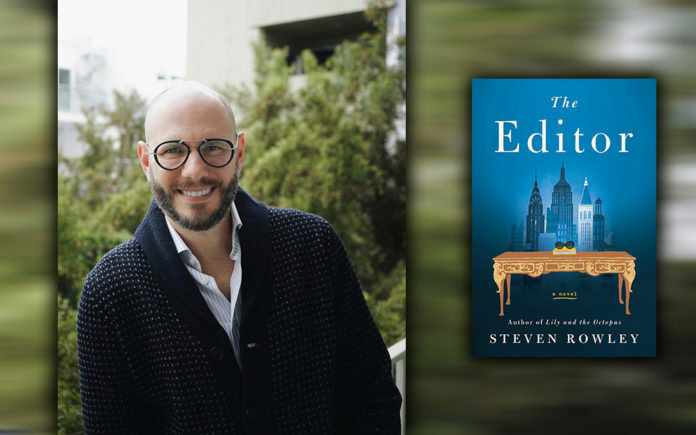 In The Editor by Steven Rowley (Putnam, 310 pages), a son must come to terms with his mother. The story begins with James Smale, a first-time novelist, who has an appointment to meet a Doubleday editor interested in his manuscript. It is a huge opportunity. If the editor likes the book — and Smale — it will be a dream come true to actually get his work in print purchased by a major publishing house. When the editor arrives, Smale is gobsmacked. The editor is Jacqueline Kennedy Onassis – the former first lady of the United States. She loves Smale’s book. However, she declares it needs work, a new title, and it especially needs a better ending. Author and editor form a bond as Smale does his best to work out the very personal nature of the narrative. The manuscript is about his difficult relationship with his mother. Smale’s title is “The Quarantine.” It is about a son who locks himself and his mother in a room until he can get her to divulge the secrets he knows lurks somewhere within her soul. If he can find what haunts his mother, then maybe he’ll truly know the woman. As Smale rewrites, his personal relationships are challenged. His boyfriend grows distant and his mother won’t read the book. But after Smale discovers a family secret, he has a personal breakthrough, which gives Mrs. Onassis the ending she had hoped for. This story exploits a clever premise and delivers a charming, believable relationship with the famous first lady and Doubleday editor. I really enjoyed dropping into Mrs. Onassis’ life as Smale’s editor. Author Rowley captures her voice and mannerism. Albeit fictional, it is a glimpse into what her private life might have been like as she tried to blend into New York City and live like a normal person with a job that matters. Rowley clearly did a great deal of research about Mrs. Onassis. As Mrs. Kennedy Onassis — the first lady who served as a mother and role model to the country during her husband’s short term — guides Smale through the rewrite, he gets a fresh perspective about the narrative of the past and lessons on how to move forward with dignity and grace. At times, I felt the story was an extended metaphor. The desire we have for the perfect mother who helps us edit our life and work out the ending with respect and unconditional love. Is Mrs. Onassis a figment of Smale’s imagination? The Editor is a nice blending of a well-known notable person of the world into a fictional story. As slight as the plot is, Mrs. Onassis is an inspired conceit as Smale comes to terms with understanding the past and the roles we play. However, if Mrs. Onassis were not the editor in the story, I’m not sure the novel would work. Mrs. Onassis serves as the catalysis for Smale to discover a new admiration for his mother, healing and writing. Our parents are not perfect, but they are our parents, and they are just people with flaws and a past, who are also products of their time and place on the planet. Previous articleAre You Road Rageous?